It was in 212 Auto Expo, New Delhi Suzuki displayed a mini SUV concept. Since then the loyal Suzuki fans in India has been waiting with mouth watering to see a glimpse of the mini SUV in flesh. 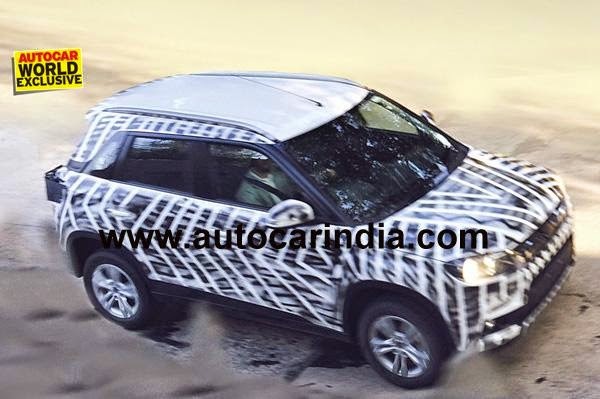 Good news is that the mini SUV (codenamed Alpha XA) has been spied for the first time with some camouflage. This is the first ever spy picture of Maruti Suzuki mini SUV Alpha XA. It is not sure whether the test mule has reached Indian shores, but since the spy photo has appeared, it suggest the vehicle’s launch in India in the next six to eight months. The heavy camouflage of the mini SUV reveals very less about the vehicle’s design architecture. However the mini SUV looks p roportionate in dimensions with some sharp looking features. It indeed looks to be under 4 meter length mark and hence qualifying for small car norms. The backwards sloping window line is the signature sign of the recent Suzuki vehicles (Even Swift has backward sloping window line). The air dam looks big and the headlamps are in close resemblance to that of the concept Alpha XA. The floating ‘C’ pillar is the highlight of the mini SUV design. The wheel arches are bulged giving a muscular look, plastic cladding might give aesthetics to the mini SUV. As seen from the picture, the mini SUV will have tail gate mounted spare wheel, like that of Ford Ecosport. Maruti Suzuki will use its 1.4L K series petrol and 1.3L DDiS diesel engines for the new mini SUV. Some sources say Suzuki might bring in its self developed (still under development) 1.5L diesel engine for India through this mini SUV. If that is the care then Maruti might price the mini SUV very competitively as using its own engine will cut costs by not paying the royalty money for Fiat’s Multi-Jet engine technology. Practically speaking, Suzuki’s 1.5L diesel engine should be powering the mini SUV as its competitors (Ford Ecosport, Hyundai ix35) are/will be run by bigger 1.5L diesel engines. Autocarindia says Maruti Suzuki will unveil the mini SUV Alpha XA at New Delhi Auto Expo 2016. But we feel Suzuki might launch the mini SUV in India sooner than that because Maruti Suzuki does not want to lose a good piece of market share, which they always hate to do so.